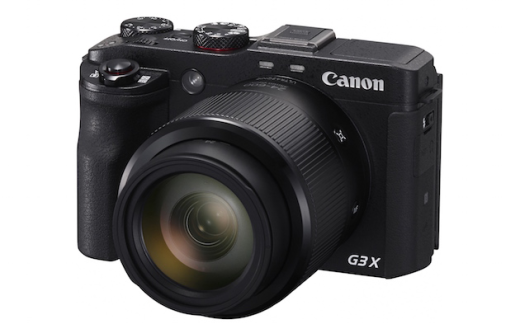 The Canon PowerShot G3 X combines the latest G-series technology with a 24-600mm f2.8-5.6 zoom lens and 1.0" 20.2MP sensor into a stylish, carry-anywhere compact camera. The first in the G-series to feature a 25x zoom, the G3 X provides users with a versatile focal range, from wide-angle to telephoto, making it ideal for a variety of photographic genres including landscape, close-up, portrait, sport and wildlife. The sensor provides rich detail for large-scale prints and creative cropping and the DIGIC 6 image processor delivers exceptional noise reduction and cleaner images, even at high ISO speeds. Additional features include Wi-Fi with NFC, Full HD movie recording, a tiltable touch screen and an extensive range of dials and manual modes to put you in control.